Ramadan Kareem! On behalf of the ICCA we would like to wish you and your family a blessed Ramadan. May we make the most of this blessed month and may Allah accept our fasting, prayers and good deeds. Ramadan will start either Wednesday May 16th, 2018 or Thursday May 17, 2018. If the moon is sighted and Ramadan starts on Wed. May 16th, the first night of Taraweeh will be Tuesday May 15th. Salatul Isha begins at 10:20 P.M. followed by Taraweeh inShaaAllah. We’ll update you as soon as we get new information of moon sighting inshaaAllah. A reminder that ICCA will have daily potluck iftars inShaaAllah. Please bring your favorite dish to share with the community. 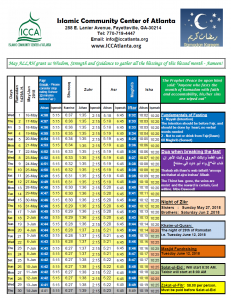 Please see the attached Ramadan Time Table for prayer times and schedule.